Our child sponsorship program is designed to support children's development by fostering relationships with our donors while providing for their physical needs through financial support. We understand the importance of a child's emotional development and aim to equip our partners as they seek to provide holistic care. We also believe there is value in linking individual orphans with specific donors and we encourage regular correspondence through our child sponsorship program, building bridges across cultural divides. This emotional link can be very precious for an orphaned child. As well as sending letters, we encourage donors to pray regularly for the child they sponsor. If you would like to sponsor a child, please click here. The financial support provided by the donor benefits the whole community by funding practical help, such as meals, clothing, and school fees, to all of the children in our partner's care. We distribute funds fairly to avoid potential relational problems caused by jealously. With the support and the assistance of sponsors, we work with children's homes and other organizations caring for children to help our partners develop the capacity to take care of themselves. Our programs aim to address the needs of both sponsored children and other children in their community. 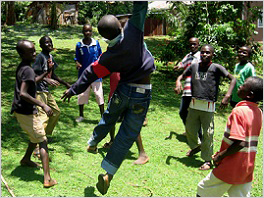 Child sponsorship also helps to challenge and educate sponsors in the developed world by encouraging connections between African children and our supporters across the globe.